History and Genealogy of Holyoke, Massachusetts. Mountain Park -- The Holyoke destination we all loved. Mount Holyoke College, Postcard History by Donna Albino. Many Holyoke women have attended Mount Holyoke. Author also maintains an amazing MHC website based upon her personal collection. Holyoke-Chicopee: A Perspective, by Ella Merkel DiCarlo. DiCarlo, a former Transcript columnist offers a fascinating compilation of her essays. Published in 1982, this out-of-print book is worth looking for in the aftermarket. Holyoke, by Craig Della Penna. The first Holyoke book in the Arcadia series, published in 1997. Belle Skinner Collection, by Ruth Isabel Skinner. Published in 1933, this book is long out of print but copies are still available in the aftermarket. Mitch Epstein: Family Business Published in 2003, available in the aftermarket. Epstein's furniture. 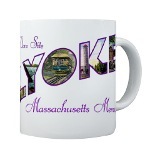 Become a fan of Holyoke, Mass on Facebook. 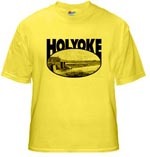 Some Holyoke images — you can check out where the location is (or was) on the map! This is a Flickr badge showing photos in a set called Holyoke. Make your own badge here. Buy something & help support the site!